When your cat’s nails get too long, it can cause a number of issues. Their sharp tips can wreak havoc on your clothes and soft furnishings, and make that affectionate kneading which many cats enjoy an absolute nightmare. Some outdoor cats may walk on and claw enough rough surfaces to keep the tips relatively dull, but for many this natural filing just isn’t enough. Cats’ claws grow in shell-like layers, and they sharpen them by grinding the top layers off. When felines find themselves unable to complete this vital process, problems such as ingrown nails and their attendant infections. Some years ago, declawing cats was considered the best solution, but today the process is considered cruel and unnecessary, with many vets refusing to carry out the procedure even as a last resort. Luckily, there’s a humane alternative: clipping your cat’s nails. To do this, you’ll need a sturdy pair of clippers designed specifically for pets – and there are hundreds of options to choose from. That’s why we’ve put together this buying guide, selecting our top 10 favorites so you can make an informed decision. We’ve also compiled some useful information about how to trim cat claws safely and effectively, with minimal stress to your kitty – good luck! Starting off our list are these cat nail clippers by Epica. The sturdy nail cutters are available in two different sizes, making them the perfect option for cats of all sizes. 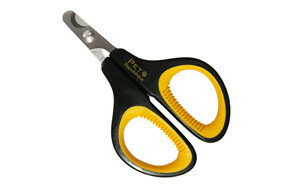 They also feature semi-circular blades, specially designed for safe and accurate cutting. The blades allow you to see exactly where you’re cutting, so you can avoid accidentally cutting to the quick. Thanks to Epica’s high grade stainless steel, a gentle squeeze is all it takes to smoothly and effortlessly cut through the sharp nail tips. For you and your pet’s safety, the clippers can be locked closed when not in use. Their rubber coated handles make them easy to grip, too, so you can cut with confidence and no fear of slipping. Finally, these pet clippers include a lifetime warranty, so you know that Epica put great faith in the quality of their product. Customers say that the nail clippers are strong and sturdy, perfect for both cats and dogs. For less than $10, they’re also excellent value for money. The next item to make it onto our list is Safari’s professional grade cat claw clippers. Available in two different sizes, they’re suitable for both cats and dogs of all sizes. Their stainless steel blades are sharp enough to slice through claws with ease, so you won’t need to apply much pressure as you cut. The clippers also feature a safety stop, so you won’t accidentally cut yourself when not in use. As well as this, comfort grip handles to make the process as smooth as possible. The tool’s durable cutting edge is designed to last for a long time, so you won’t need to worry about replacing it for years to come. Users say these nail trimmers are easy to use, and sharp enough to cut through claw tips with very little effort. Pet Republique’s professional pet nail clippers are designed to a professional standard, to cut your pet’s nails without hassle. Their thick stainless steel blades are able to slide through claw tips with ease, while ergonomic, rubber coated handles make gripping them easy and convenient. Because their blades are so sharp, cutting the nail requires minimum pressure, making the whole experience far more comfortable for your feline friend. The small size of these clippers make them easy to manoeuvre into place even with smaller paws. 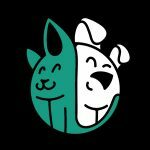 15% of Pet Republique’s profits are donated to the American Animal Rescue society, so choosing their brand to look after your own pet also has a positive impact on the lives of others across the country. The clippers also include a 30 day money back guarantee, and a two year warranty, so you know they’ll last even with frequent use. The next pair of clippers to earn a spot on our list are these easy to use and budget friendly pair by gonicc. Their carefully crafted ergonomic design makes keeping a tight grip easy, while a non-slip rubberized coating prevents them from slipping from your grasp during use. This, combined with sharp and durable stainless steel blades, allows the clippers to glide through claws with just a gentle squeeze, making the experience quick and comfortable for your kitty. The nail cutters are lightweight enough to hold for long stretches of time, but durable enough to stand up to regular use. They also include a hidden nail file, conveniently stowed away in the handle, so you can polish sharp nails with ease. The blades also feature a safety stop, keeping their sharp edges out of the way when not in use. Gonicc offer a lifetime warranty alongside the clippers, so you can rest assured you won’t need to replace them any time soon. Shiny Pet have earned themselves a spot on our list too, thanks to their eco-friendly clippers. The clippers are designed specifically for small pets, making them an ideal choice if your feline friend happens to be petite or just a kitten. Their handles are made from 100% recycled plastic, moulded into an ergonomic shape that makes for easy and comfortable gripping. Meanwhile, razor sharp blades slide through nails with very little pressure, making the experience as comfortable as possible for your cat. The classic semi-circle shape of the blade keeps claws visible during every cut, for maximum accuracy. These stainless steel blades are hypoallergenic, too, so no need to worry about pets with skin sensitivities having an adverse reaction. Shiny Pet even offer a lifetime money back guarantee on this product, showing the faith they have in its quality. Although they’re tiny, these petite pet nail clippers by H&H should not be underestimated. They feature a lightweight, scissor-like design, allowing owners excellent cutting control, even when over the smallest of claws. The rubber coated handles ensure a comfortable grip, while semi-circular blades keep nails visible at all times for excellent accuracy and safety. These blades are made from high quality stainless steel, hypoallergenic, sharp, and durable. All H&H products also include a 100% satisfaction guarantee: if you aren’t happy, they offer a no-questions-asked refund. Another great reason to choose H&H is that 15% of their profits are donated directly to animal charities. By looking after your own pet, you can also do your bit to take care of less fortunate animals. Customers report that these clippers are a great option for cats thanks to their small size and easy manoeuvrability. They’re also available in a larger size. Whisker Wishes have also found a spot on the list – their scissor-style nail clippers are designed and manufactured to the professional quality expected by veterinary professionals. Their high quality stainless steel blades are sharp enough to make for a quick and easy cut, while their grippy handles are equally comfortable to use whether you’re right or left handed. Like most good quality cat nail trimmers, this pair have semi-circular blades, which keep the nail visible as you cut, ensuring accuracy and preventing painful injuries such as accidentally cutting to the quick. Users say that the blades offer a clean cut, without obstructing your view of the nail. Their small size is ideal for cats and kittens, and also makes them easy to negotiate into place, even if your feline friend is a little reluctant at first. The next pair of clippers to make our list is this nifty set by Simply Pets Online. Featuring a lightweight design, razor sharp stainless steel blades, and easy to grip handles, the clippers have been carefully crafted with the input of experienced vets. They’re small enough to cut the claws of most kittens and cats, and are feature curved blades that keep the nail in sight throughout the process. You can also use them on the nails of rabbits, birds, and guinea pigs. In addition, these clippers have undergone extensive testing, to make sure they’re up to scratch (pun not intended). Because they’re sharp enough to cut through claws without the application of much pressure, cats find them easier to tolerate than lower quality options on the market. They also include a lifetime guarantee from the manufacturer, indicating their ability to last and last. Resco’s deluxe pet nail clippers certainly live up to their name. Made in the USA to a high standard of quality, the clippers feature a guillotine style design that dates back to 1937. Their patented blade replacement technology allows you to switch out a blade when it’s dull, rather than buy a whole new pair of clippers. This not only saves you money, but reduces waste. The deluxe grips on this model are finished with a premium red powder coat, adding comfort as well as grip. As well as being comfortable for humans, it’s also comfortable for pets – the micro-honed steel cutting blade glides through nails with very little effort, making the clipping process as stress-free as possible. Resco offer each of their customers a lifetime warranty along with the clippers, backing their excellent performance for years to come. If you need to clip nails regularly, then these vet and groomer recommended clippers could be the perfect option. If you find small handles difficult to manoeuvre, then Ebelyn have you covered. Their large-handle design makes for easy gripping, as you negotiate your pet’s paws into place. Although the handles are big, the blades themselves are small enough for use on the claws of small cats and kittens. These sharp, stainless steel blades feature the typical curved design that keeps nails easily visible for accurate and safe cutting. The scissor-like design offers users great control over the cut, improved by the close proximity of the handles to the actual blades. Users report that the clippers offer a clean and precise cut, preventing ragged or crushed nails. The great view of the nail they provide also prevents accidents involving the quick. All this adds up to an experience that’s comfortable for both owners and pets. These 10 pairs of nail clippers represent the best the petcare market has to offer, and any option would make a great nail care solution for your feline friend. With this abundance of choice, however, picking out the perfect pair for your kitty can be a surprisingly daunting process. That’s why we’ve compiled this useful buying guide: we hope that by providing some useful information about these devices, and how to use them safely, you’ll be able to find the perfect pair and get the most out of them, too. The first thing to bear in mind when selecting a pair of nail clippers is their size. For most cats, it’s a good idea to select the smallest size offered by the manufacturer, as their claws are relatively thin. Using blades that are too thick will reduce the accuracy of your cutting. When choosing a pair of nail clippers for your feline friend, look out for curved, semi-circular blades. This design will encircle the nail perfectly, and also ensures you can see the nail while you cut. This makes for better accuracy, and helps prevent you from accidentally cutting the quick. You’ll have a few different designs to choose from when you come to select your nail clippers, each of which has its own advantages and disadvantages. We’ll discuss this in more detail later on. How often you intend to use the clippers should also play a role in your decision. If you only have one pet, choosing a less expensive design, without a changeable blade, will be sufficient. However, if you need to use the device on multiple pets, or in a professional context, you could consider a heavy duty design with replaceable blades. As all cat lovers know, scratching is a perfectly natural behavior. It helps cats to keep their claws in good condition by shedding the old, outer layers and revealing fresh new ones. However, when scratching isn’t limited to designated surfaces, tensions can rise. Clipping off the sharp tip of your cat’s claw limits the damage they can do to your furniture and skin. Clipped claws also allow cats to affectionately knead you without doing damage, promoting bonding. Another reason to trim your cat’s claws is for health. When claws grow too long, they can become caught on carpets and break off painfully. In some cases, this can result in an even more painful nail infection. Clipping regularly also promotes healthy nail growth, and prevents ingrown nails. Although declawing is frowned upon in veterinary communities more and more - and banned entirely in many countries - some owners still use it to prevent destructive scratching. Unfortunately, declawing is a painful and risky surgery, that impacts your cat’s ability to walk, run, and climb for the rest of their life. In other words, preserving your furniture is not worth the suffering this procedure causes. Clipping nails drastically reduces the damage cats do, without having to resort to declawing. If your cat’s claws are still wreaking havoc even with regular clipping and training, you could consider giving cat claw covers a go. Be sure to attach them carefully, and use the right size so your cat can still retract their claws, or you run the risk of pain and infection. 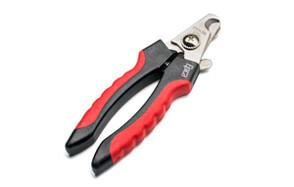 Traditional Clippers - traditionally styled clippers look much like the secateurs you would use in the garden. They have two handles which, when squeezed together, close in around your cat’s claw and clip it. These clippers are solidly built and great for tougher claws, but may not be as easy to manoeuvre as other designs, particularly if you’re dealing with more delicate kitten claws. 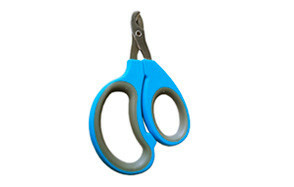 Scissor-Style Clippers - As the name suggests, these clippers are shaped like a conventional pair of scissors. Looped handles mean they’re easy to hold and manoeuvre, and these handles are typically located very close to the blades themselves. These designs tend to work best for smaller cats and kittens. Guillotine Style Clippers - For a good example of this type of clipper, see entry number nine on our list. The design is also operated by squeezing two handles together, triggering a blade to emerge from the device. Unlike the other designs, the blade moves outwards while the handle moves downwards, rather than both moving in the same direction. Some users find this design more difficult to operate, but it’s especially durable, and the blade can usually be replaced, making it ideal for heavy usage. Q: How to use cat nail clippers? Before you go anywhere near the clippers, your cat must be used to having their paws handled. When your cat is relaxed, begin by petting their paws. They may withdraw them or walk away, but don’t be deterred; just pet them whenever you have a chance and your kitty will gradually become used to the sensation. Whenever you pet their paws, use praise and the odd treat to foster positive associations. When your cat will let you hold its paws without issue, your next step is to massage them. Your eventual goal is to gently squeeze each pad to extend the nail. Ensure your cat is comfortable with it before going further. When you’re confident that your cat will allow you to hold their paw and extend the nail without becoming stressed, the time for trimming has come. Wait until your cat is feeling sleepy, and position them on your lap; on their back with the rear paws facing away from you. Make sure you have your nail clippers and a styptic pencil within reaching distance. Styptic pencils can be acquired from most pharmacies, and are designed to cauterize blood vessels. They should be kept on hand in case you accidentally cut the cat’s quick. The quick is the blood supply for the claw. Next, extend the first nail to be clipped and examine it carefully to find the quick - it looks like a small pink triangle. If the quick is cut, cats experience considerable pain, and there will be a fair amount of bleeding. Cutting the quick is not only messy and painful, but will also deter your cat from allowing future nail clipping sessions. Next, take your clippers and cut just the tip of the nail, positioning the blades halfway between the end of the nail and the quick. At first, your cat may only allow you to trim one or two nails at a time, so try to be patient. Reward your cat with a treat once you have finished the process, to foster more positive associations. Q: What nail clippers should I use on my cat? A: This depends on their size and thickness. Guillotine style clippers are best for thicker, longer nails, while scissor-styled clippers are easy to negotiate with fine claws. Take a careful look at your cat’s nails before making a final decision about which style is best for them. Your comfort matters too, so look out for handles that seem easy to hold onto. Q: How often should my cat's nails be trimmed? A: It varies from cat to cat, but generally speaking you should trim your kitty’s nails every 10 days to two weeks. A good rule of thumb is; if you can hear their claws clicking when they walk on hard surfaces, it’s probably time for a trim. However often you clip your cat’s nails, try to stick to a regular schedule, and always use the same spot and procedure, so they know what to expect. This can help to minimise stress. Q: How often should you replace cat nail clippers? In our opinion, the best cat nail clippers have to be Epica’s. Their versatile and durable design makes cutting cat nails a breeze, thanks to sharp, well-designed blades, great safety features, and comfortable to grip handles. Their sharp stainless steel blades are curved to give you the best possible view of your cat’s nails throughout the trimming process - this ensures a safe, quick, and accurate cut every time, making for a comfortable experience and fewer mistakes. Meanwhile, their rubber coated handles are easy to grip and comfortable to manoeuvre, and a locking device keeps the sharp blades covered when not in use. The fact that each pair of clippers includes a 100% lifetime warranty seals the deal for us - these great value clippers are an excellent choice for both pets and owners.